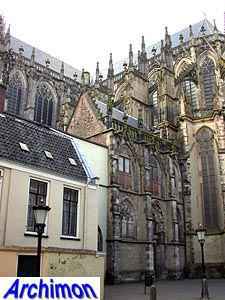 At the location of the former Roman castellum several churches and cathedrals have been built throughout Utrecht's long history. Today only one of these is left. 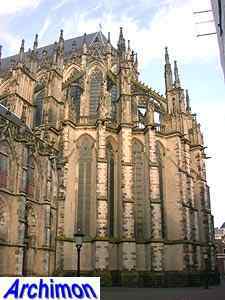 Once this was the country's largest cathedral, dedicated to St. Martin of Tours, and the one church in the Netherlands that closely resembles the original French style that later became known as Gothic, even though in contrast to its French examples it only has one tower. 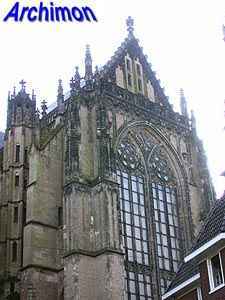 All other Gothic churches in the Netherlands belong to one of the many regional variants (see the Gothic-section for more information). 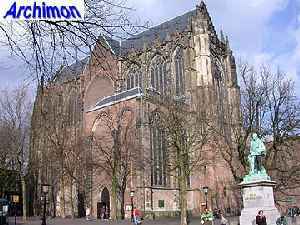 The church is usually referred to as the Dom. 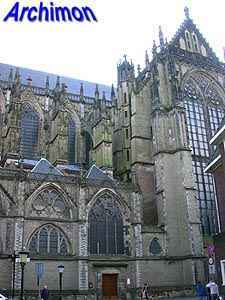 Building took place from 1254 until well into the 16th century. But calvinism came and took its toll. 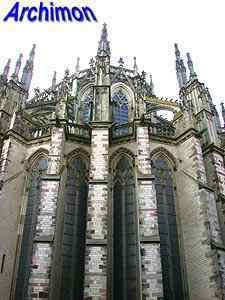 In 1572, during a wave of calvinist inspired vandalism that spread all over the Low Countries, much of the ornaments on both exterior and interior were destroyed, and when the church was finally taken from the catholics and given to the protestants much of the enormous building was neglected and left to fall apart, and so it did. 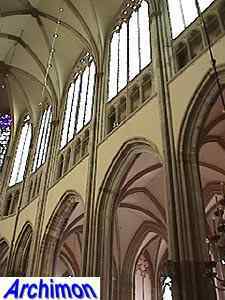 The still unfinished and insufficiently supported nave collapsed in a storm of 1674. 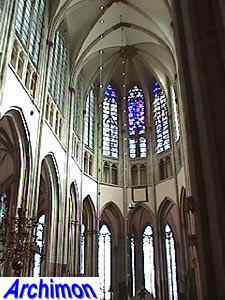 All that remains are the transept and the tower. Where the rest of the cathedral used to stand is now a square, and differently colored stones indicate the original outlines of the church, and of its predecessors. 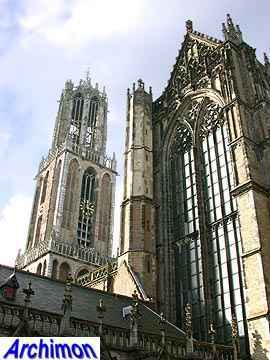 The tower was built in the same period as the church. It is 112 metres tall and it is clear that already soon after its completion this tower was considered of great importance, considering the fact that it inspired a whole new style of towers, although these towers usually are much more decorated. The lower part of this tower has very few decorative elements. The high gate in this lowest portion of the tower probably was intended as the church's main entrance. 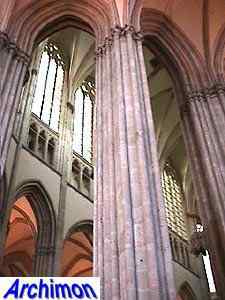 But even in the cathedral's most complete form, the tower and the nave were not connected, at least not on the ground. 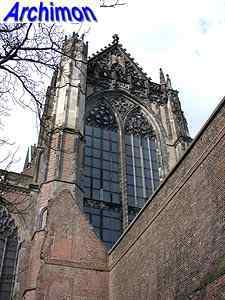 The chapter of the adjacent St. Salvator church demanded that the path leading to their church remained accessible, and therefore tower and church have always been two seperate objects, with only a chapel forming a bridge between the two. That chapel was removed long ago, but inside the tower are two more chapels. 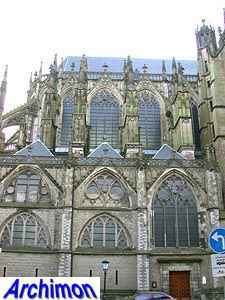 At various places at the buildings exterior traces can be found of the iconoclastic rage of 1572 and small portions of the ruined nave. Even though the various restorations of this building have often been criticized, these silent witnesses of history have been maintained. If this church had been returned to the catholics these probably would have been hidden by a reconstruction of the vanished part. 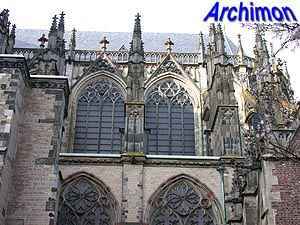 Instead of an incomplete but truly medieval Gothic church, there probably would have been a complete but mostly neo-Gothic 19th-century church now.